The Super Smash Bros. Direct started off strong in its presentation with a retro reveal of the Konami kind. 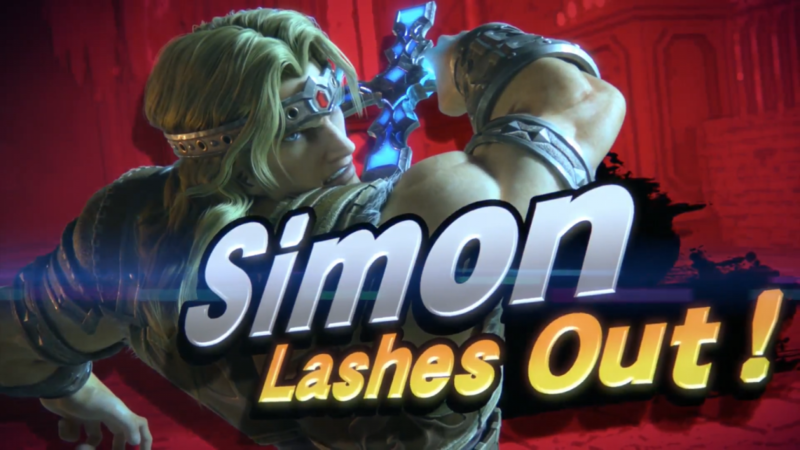 Castlevania is finally receiving some much-needed representation with the inclusion of a one famed vampire hunter Simon Belmont, and his echo fighter Richter Belmont. Their respective stage is Dracula’s Castle, which will host various monsters that appear within Castlevania. Even Dracula himself will make an appearance, acting as a stage hazard, attacking players as they battle. Richter Belmont wasn’t the only newly added echo fighter, we’ve got two more of these clone characters revealed. Chrom of the Fire Emblem series and Dark Samus of the Metroid series will both be playable in Super Smash Bros. Ultimate. Chrom actually ended up taking a backseat to his daughter, Lucina in the previous Smash title. And Dark Samus was resigned to live as a mere Assist Trophy instead of a playable character. Now, they’ll get their comeuppance as full-blown characters within the latest game. Super Smash Bros. Ultimate boasts a selection of 103 stages. Many of which, are returning from past Smash games. Classics that many are familiar with such as Fountain of Dreams and Pokemon Stadium will be accounted for. Of course, new stages will still be apparent, albeit in a smaller fashion. I can already hear that orchestral piece ringing true. On the topic of stages, we’ve got an interesting new feature which was just revealed. Introducing Stage Morph, an option that allows the player to select their two preferred stages that’ll then transition into one another during a match. Sounds crazy, right? Stage Morph in action during a battle. A new option added to the rulesets is the addition of a mechanic akin to a ”Super” meter found in 2D fighting games. Final Smashes can now be gradually built over the course of a match which are indicated with a nifty bar located below your character icon. Once filled, you can unleash a slightly weakened version of a Final Smash. New meter gauge option for Final Smashes. Finally, this Super Smash Bros. Direct concluded with one more character reveal. A big baddie who debuted in the original Donkey Kong Country series for the SNES. The leader of Kremlings and unabashed thief of Donkey Kong’s banana hoard, it’s King K. Rool! The villain side of the roster is filling out nicely. Super Smash Bros. Ultimate releases on December 7, 2018, on the Nintendo Switch.